What to Do With Your Unwanted Plastic Carrier Bags? Home > Recycling Issues > What to Do With Your Unwanted Plastic Carrier Bags? 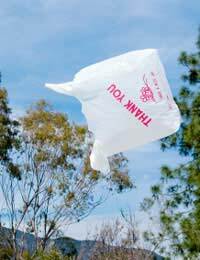 According to latest estimates, the average household in Britain is home to around 400 plastic carrier bags per year. Most people now realise that plastic supermarket carrier bags are very bad news for the environment and have switched to reusable plastic or fabric shopping bags instead. Having said that, we all know how easy it is to be caught out! In surveys, when people were asked why they were using plastic carriers, the most common reason was that they’d forgotten to take a shopping bag with them. So, chances are that you occasionally take home plastic carriers - despite your best intentions. Fortunately, there are literally dozens of extra uses for the humble carrier and when it’s finally ready for the bin, you can take it back to the supermarket for recycling. To keep bread fresh for longer, place it inside a carrier bag along with a stalk of celery and close tightly. Use an open carrier bag on the worktop when peeling vegetables. Once finished, you can simply empty the bag into a bin (or add your peelings to the compost pile). Clear up quickly after a party or large meal by hanging a carrier bag from a kitchen unit door and simply scraping leftovers from plates into the bag. Clean up a broken egg quickly by putting your hand inside a carrier bag and then scooping the egg straight up and into the bin. Clean a dusty mop easily by placing the head inside a carrier and closing tightly. You can then shake the mop vigorously - keeping all the dust and dirt inside the bag. To remove lime scale from shower heads, tie a small carrier filled with vinegar or de-scaler around the shower head so that it is submerged. Leave until the lime scale has dissolved and then rinse clean. When painting a ceiling which has a fan or central hanging light fitting such as a chandelier, cover the fan blades or chandelier with a carrier bag and tape closed at the top. This will prevent paint splashes on the fitting or fan blades. When wrapping small breakable items for storage or moving, place the item in a plastic bag then inflate by blowing into it and secure with tape or a rubber band. Use plastic bags inside your boots to keep your feet dry in wet or snowy weather. You can also tie plastic bags over the top of shoes when working in a muddy garden. Simply throw away the bags when finished. When travelling, pack your shoes in plastic carrier bags to avoid them marking clothes – and to avoid the smelly shoe smell on other belongings! Keep carrier bags in the car for use when you go to the beach. You can use them for wet towels and swimwear – and for a child’s collection of sea shells. Plump up ailing cushions by stuffing them with spare plastic carrier bags – but remember to remove before washing. Store carrier bags for future use – inside a carrier bag hung inside a cupboard. Finally, always remember that plastic bags of any type are a suffocation danger so store them well away from children.